The Auriemma experience is about relationships. Our people work hard for our clients and we work hard for our people – by developing them professionally and empowering them to transform our company for the future. Working here encompasses respect, accountability, and support. We have honest conversations with employees about their career goals and work to help them get to the next level. That means immersion in new business areas to accelerate learning and development, exposure to a vast professional network, and diverse project work that can take their careers to new places. We hire smart, creative, and intellectually curious people who rise to the challenge and go above and beyond for clients. If you like collaborating on small teams and making a direct impact on client and company goals, this might be the place for you. Explore our job openings and learn more about what it’s like to work here. Marjorie got her first taste of accounting in college at Stony Brook University, where she served as treasurer of the student government. Marjorie got her first taste of accounting in college at Stony Brook University, where she served as treasurer of the student government and controlled more than $1 million in student activity fees. She liked accounting so much she decided to make a career of it, working as a staff accountant for various organizations before joining Auriemma Group as bookkeeper in 2007. Marjorie has been promoted twice since then and currently serves as Senior Manager of Accounting for the firm. In 2018, Marjorie joined Auriemma’s “A-Team,” where she helps plan company-sponsored events. What do you like about working for Auriemma? Because we’re a small firm, you have the opportunity to be involved in the different stages of any project or work that needs to get done. You have the ability to see where your interests truly lie, and you’re given the opportunity to create a role that aligns with those interests and the company’s business needs. You’re able to forge your own path. It’s not just pure accounting. I’m an architect too. I build things. For example, last year I led a project to automate the expense management process. I helped move the firm from paper expense reports to a web and mobile application. It improved the experience for staff submitting expense reports and increased efficiency for accounting, since all expenses are now easily transferred into our accounting system. Outside of work I play an active role in my son’s life. I coach track, serve on the Boy Scouts committee, and helped put together the yearbook for him and his classmates. With the Boy Scouts we’ve gone hiking, running and biking. I didn’t think I’d like hiking, but we did a bunch of hikes for his merit badge and I liked it! Jack worked for HSBC and Lloyds Banking Group before joining Auriemma Group in 2014 as a Manager in the Partnerships practice. 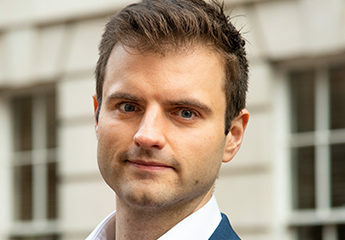 Jack worked for HSBC and Lloyds Banking Group before joining Auriemma Group in 2014 as a Manager in the Partnerships practice. He’s been promoted twice in his time at Auriemma, going from a support role to leading projects, securing new business, and helping junior employees develop. When I was looking at what to study at university, the best advice I got was to do what you love. I’ve followed that through in my career. For me, if it’s not interesting and won’t motivate you, you won’t perform at your best level. So my best advice is to find something you’re genuinely interested in, something you have a genuine appetite and hunger to learn about. What experiences have had the biggest impact on your career development? I started out working in bank branches on the front line. In that type of role, an important skill is translating written communications in a way that makes them easy for customers to understand. I quickly learned the importance of language and communication and how you explain something. I’ve used those communication skills in my role at Auriemma. How do you communicate the most salient bits of information in a concise manner, and how do you keep internal and external stakeholders updated? If you’re trying to influence and overcome objections, what are the most important things people need to know? Cycling is a huge part of my life. I’m part of a club and race competitively in a number of events. I also cycle to and from work. On my way into the office I plan out my day. How do I make sure I tick off everything I have to do? Coming home I reflect on the day. How’d it go and what can I do better? When I get home my work is truly done and I manage to not take it home with me. If you could choose one experience that encapsulates the culture at Auriemma, what would it be? The opportunity came for me to move to the New York City office in 2019 and pick up one of the roles on the Partnerships team. When I went to the Leadership Team their biggest concern wasn’t whether I could do the job or anything role-related. It was about my personal life and whether the move would work for me. We decided the best option wasn’t to move but to spend more of my time working with the team in the US and to travel there more often. A lot of companies say it’s about the people but here it really is. Lindsey was three years into a journalism career when she heard about Auriemma Group through a recruiter in 2011. Lindsey was three years into a journalism career when she heard about Auriemma Group through a recruiter in 2011. 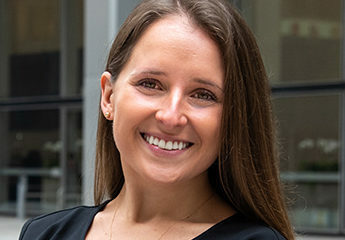 After learning more, she saw connections with the skills she used in journalism, and decided to join Auriemma as an Associate in the Industry Roundtables practice. Lindsey started applying her writing and analytical skills in new ways, and her career with Auriemma quickly took off. After several promotions, Lindsey is now a Director responsible for advancing the business model and strategic direction of the Roundtables practice. How does your background shape your perspective in your role at Auriemma? Coming from a journalism/writing background I have a natural tendency to want to take a step back and evaluate all angles of a situation while questioning and digging deeper into the issues. Auriemma allowed me to see how I could apply that skill to a business-focused role and use it to shape processes, find efficiencies, and creatively think about our business model now and in the future. My role started out more tactical and has since evolved into more strategic thinking. That growth is due to Auriemma’s willingness to give employees from different backgrounds the flexibility to explore and experiment in using their skills. Managing our team of associates for four years taught me how to be assertive, how to listen, how to deliver feedback, and the type of leader that I want to be. I learned interviewing and recruiting skills and had the opportunity to create a career path matrix for the company that has helped associates advance in their careers at Auriemma. At times it was stressful, but watching associates grow and develop was the most rewarding experience. How have professional relationships influenced your career at Auriemma? The access I had to our Senior Leadership Team when I first started as an associate was very different from any other company. Associates were encouraged to have formal meetings with the Leadership Team to learn more about the company and their respective roles. It was through those one-on-one conversations that I learned about the culture and vision of the company and how I gained confidence to express new ideas. Describe the work-life balance at Auriemma. Flexibility and work/life balance are extremely important values at this point in my career. To know I have the trust and support of the company to be an effective and productive employee while still being there for my family is invaluable. It’s extremely difficult to feel like you have to choose between being there for your child and your career. Auriemma has provided me with the ability to do whatever needs to be done to be present and successful at both. A few years ago, the staff got together to organize a wiffle ball game. All employees played a role in helping to organize the event and everyone brought an item to contribute to the day. All staff levels participated, and many brought their families along to the event. The teams were Mets vs. Yankees fans and everyone had a great time observing or participating in the competition. That same type of environment is what you can expect when you’re working on an Industry Roundtable or a project. All staff levels are engaged and come together to each play a role in contributing to the end goal. Jonathan joined Auriemma in 2014 after obtaining an MFA in Writing from Savannah College of Art and Design (SCAD). Jonathan joined Auriemma in 2014 after obtaining an MFA in Writing from Savannah College of Art and Design (SCAD). 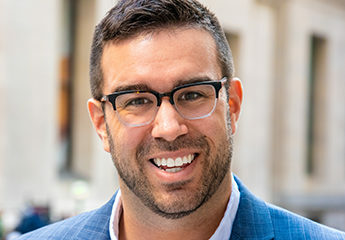 He applied his written and visual communication skills in his role as Industry Roundtables Associate before transitioning to Auriemma’s Research practice in 2016. In his current role, Jonathan translates complex payments data into reports, infographics, and articles. He’s also taken his career to new places as co-manager of the firm’s brand strategy and social media efforts. My background is in writing and graphic design, which informs my approach to data storytelling and visualization. Transitioning to the Research team allowed those skills to shine. My job is to take complex ideas and distill them into messages that will resonate with clients. It’s a unique and exciting challenge to make data come alive for people. When I think back to my supervisor relationships here I’ve always felt very supported in where I’ve wanted to take my career, even if it was outside what’s expected of me on paper. In my previous role on the Roundtables team, my supervisor pushed me to get involved in projects that aligned with my skills, even if they weren’t part of my day-to-day. She also supported and advocated for me in my transition to the Research team. The people here really care for their co-workers and want to see them succeed. If you express an interest in something outside your job role they’ll remember and turn to you when something comes up. It’s a huge positive. Talk about the people at Auriemma. When I come to work I look forward to seeing my co-workers. There’s a certain atmosphere here that’s very welcoming. It’s a place I like to work. Having people you trust, get along with, and who support you in your career – that’s important in any company and we have a good mix of it here. I’ve been swimming competitively for 25 years and recently made the transition from the pool to open water. Currently, I’m training to swim the 28 miles around Manhattan. Fun fact: I still swim at the beach in the winter. Snow, sleet, whatever! Nicole spent three years teaching English in Vietnam before a friend referred her to Auriemma Group in 2017. Nicole spent three years teaching English in Vietnam before a friend referred her to Auriemma Group in 2017. After learning more, Nicole saw many parallels between the Industry Roundtables model and her background in teaching and decided to make the transition. During her time at Auriemma, Nicole has carved out a niche in customer service-related roundtables and leveraged her teaching skills to take on new responsibilities like training new hires. Before this I was teaching English in Vietnam to children and adults of all ages. That plays into this role in a number of ways, especially training new employees and developing assignments for them. In the future I’d like to use my teaching skills to facilitate roundtable meetings. Teaching taught me patience and organization, and living overseas made me very comfortable interacting with people in different environments. The first example is my peers, helping each other out during busy periods and really leveraging each other. The people here are super approachable and I always feel comfortable asking questions when I need help. The second example is Kathy, my supervisor, who’s become a mentor to me. I really look up to her and she’s helped shape me in a lot of ways. Describe your role in the training process. What have you learned from that experience? Training new hires has taught me how to trust in my coworkers’ abilities. I’m always impressed with how capable they are. I’ve also learned how to give constructive feedback. How do you like to unwind after work? What do you enjoy outside of work? Spending time with friends and family is important to me. I’m also a big foodie and like to try new restaurants constantly. Sports-wise, I run, I ski, and I golf. I travel a lot too. I recently went to Colombia, Nova Scotia, Sri Lanka, and Myanmar and I’m planning a trip back to Vietnam soon. Travelling with my co-workers. There’s one experience that stands out and shows the culture of collaboration at Auriemma. My coworkers and I were in San Antonio and took over the entire hotel lobby working to get everything ready for a roundtable meeting. Once we got everything done we went to the Alamo together, rented Lime scooters, and rode them to dinner at a Mexican restaurant. Danny began his career at Standard Chartered Bank, where he advanced from the fast-track graduate program to payments product manager. Danny was born and raised in Karachi, Pakistan. He obtained his B.Sc. in Economics from Lahore University of Management Sciences and went on to work for Standard Chartered Bank, where he advanced from the fast-track graduate program to payments product manager. In 2016, Danny moved to New York and joined Auriemma Group as an Associate in the Industry Roundtables practice. A year after joining Auriemma, Danny was promoted to Senior Associate and took an opportunity to transfer to the London office, where he’s helping grow Auriemma’s UK practice. Moving to New York was already a big change for me. I never in my wildest dreams thought I’d be moving again to the UK, but it was a great opportunity professionally. When the opportunity arose, I raised my hand for it and it worked out. It was a combination of my initiative and the company being flexible to accommodate and support me. It ended up being a win-win for both of us. Working for a small company that’s growing rapidly, there are always opportunities as long as you’re open to taking on new challenges. Now I have experience in two major markets and a developing market at home. You have to be a self-starter, especially early on in your career. Taking initiative and being eager to learn signals to your team that you’re a reliable resource, someone people want to invest in professionally. When people notice this trait they’ll entrust you with greater responsibility and opportunities to grow faster. When I joined Auriemma I focused on my core responsibilities and over time I was able to branch out into other projects and lines of business. More recently I’ve been focused on business development efforts in the UK, including presentations and market analyses of the auto finance and consumer banking sectors. I’m very fortunate to work with great people and mentors at Auriemma. They’ve taught me how to build relationships with clients, and in my move to the UK my supervisor has given me a lot of responsibility and autonomy to help develop the practice here. I’ve also developed a network and rapport with industry leaders within the payments landscape. It has certainly been one of the highlights of my experience at Auriemma. I love playing and watching sports, especially football (soccer) and cricket, and spending time with friends and family. I also enjoy reading. The last book I read was Freakonomics, but I wouldn’t say there’s one genre I like best. I used to like fiction and now I like reading biographies, especially about people who start from humble beginnings and work their way up. Stories like that give me inspiration for my own life. At all levels of the organization, the idea is to work hard and deliver. But there are troughs and peaks and you’re given the freedom to manage your workload. It’s better than encouraging a culture where people feel the need to stay late. In my time here, I’ve never felt pressured to work later or take out time from my personal life to work. But all of us at Auriemma take ownership of our work and are willing to put in the extra effort without being asked to. That’s how it should be. That’s key. Auriemma’s mission is to help clients make better decisions by providing them with accurate, creative, and actionable insights. Our core values drive everything we do: How we interact with each other, how we serve clients, and how we approach our work. are passionate about what we do.